Add PS5 Release Date to your website! The PS5 Release Date will be in November 2020. We predicted this date in 2014! With the now officially confirmed PS5 the release is expected to dominate gaming consoles once again! This release date countdown is based on our trusted sources, careful review of historical and current trends, current news, credible leaks, research, and gaming industry data. The best estimate for the PS5 Release is November of 2020. Sony did not announce any hardware at E3 2018. We accurately predicted the official PS5 announcement would be in 2019 and it was. The PS2 came 5 years 3 months after the PS1, the PS3 came 6 years 8 months after the PS2 and the PS4 came 7 years and 5 days after the PS3. Following this trend some expect the PS5 to Release in 2020. The announcements that Sony wouldn’t be attending E3 2019, along with the cancellation of PSX 2018, shocked everyone. Sony was stepping out of the spotlight. It’s fair to say that some fans (myself included) were wondering what Sony’s plan was. While it’s certainly odd for Sony to be cancelling events and pulling out of major conferences, all of this falls in line with the major leak on Reddit that revealed several major revelations about the PS5. Some of the predictions have already come to pass. The rumors and news have reached a fever pitch. With some of the biggest PS4 exclusives in 2019 still lacking release dates, I think we all needed some reassurance that Sony knows what they’re doing. We all knew that Sony wasn’t bowing out of the gaming sphere, but it’s nice to know that Shawn is listening and that plans are in place for the new year. Things are certainly pointing in this direction. In May of 2018 we received confirmation from Sony’s CEO that the PS4 has entered the final stage of its lifecycle, which means that Sony is planning ahead for the PS5. Sony has said that they will spend the next three years preparing for the next big step forward. This would put the PS5 release date sometime in 2020. Now, that “S” certainly looks like a 5. It could be a tongue-in-cheek way to teasing a PS5 reveal in the new year. Some have also said that it could represent five years that the PS4 has been out. It could also just be an “S,” but that’s no fun. Besides, we know Sony is working on the PS5. In fact, Sony also posted a position on LinkedIn looking for a Sr. Product Manager. This position went up in mid-October 2018. Whichever lucky soul gets this job is going to be working on the PS5 campaign, that’s crystal clear. It also shows that things are ramping up towards the next generation faster than we thought, which is why we have decided to move our prediction up to fall 2019. So, if Sony waits until 2021, it could be because they’re going to change the way we think about consoles. new information from Bloomberg suggests that Sony is going to lean more into their subscriptions and entertainment sectors. Things like PlayStation Now, PS+, and of course, great games, are fueling profits more than hardware lately. As internet becomes more widespread, it’s possible Sony is considering a streaming console instead of a traditional PS5. It’s still up in the air as to what the console will look like, but there’s still plenty of evidence showing that the release date is most likely still in flux. The crux of the argument here lies in the fact that the PS4 Pro only released in 2016, and Microsoft’s own Xbox One X released in 2017. As a result, these new consoles will need to have time to breathe before anything else comes out. Even so, that only leaves 2 years for the Xbox One X before a new competitor comes out. It would be an opportune time to announce or release the PS5, especially once the PS4 Pro is more than three years old. Anything sooner, and gamers could feel like they were swindled if they bought a PS4 Pro at launch. If we turn our attention to Michael Pachter, his predictions have previously pointed to a release date around 2019. He believed that Sony would wait until the 4K TV market reached 50% in the US and 35% in the rest of the world. In the same discussion, Lewis also predicted that the PS4 would hit the coveted 100 million sales milestone by 2019. With over 70 million PS4 consoles sold as of December 2017, it seems like a reasonable goal. If could happen even sooner! One thing is for certain: Sony won’t be releasing the PS5 until the PS4 has finished its ascent in the sales charts. There’s too much money to be had with this current generation still. Insider information from a trusted journalist in the game industry points to Sony chasing specs higher than what Google Stadia offers in their servers. Each Stadia server promises 10.7 teraflops of power, so how much higher could Sony go? Find out in our full article! Sony held their first State of Play stream in March of 2019, a format similar to Nintendo Directs. While there was no PS5 news to be found, it’s entirely possible they will use this format to talk about or tease the PS5 sometime in 2019. Find out what they did announce in the full article! Google announced their own streaming game platform in March of 2019 and made some pretty big promises. It’s also clear they intend to compete with Sony and Microsoft. Could this new contender accelerate Sony’s plans for the PS5? Find out what Google is planning in our full article! A piece of marketing material for The Last of Us Part II leaked online, revealing a potential release date for October 2019. What does this have to do with PS5? Well, it could point to the game being a launch title, but more likely it shows that Naughty Dog’s next game could be a title that comes out on both systems. Find out more about what we think in the full article! A Reddit user accurately predicted that Sony wouldn’t be attending E3 2019, over 24 hours before they announced it publicly. With this win under their belt, the user went on to make some very bold predictions about the PS5’s price, release date, and specs. Find out what they revealed in our full article! Call of Duty Black Ops 4 released in November 2018, but we all know there will be another title in 2019. A job posting suggests that the next developer on deck is hiring someone for a next generation role. Even if the PS5 doesn’t release until 2020, could the next Call of Duty be ported to the PS5? Find out what we know in the full post! In June of 2018, Bethesda announced Starfield and The Elder Scrolls VI at their E3 2018 press conference. Both announcements are exciting, but the true takeaway here is the confirmation that these are both next generation titles. Therefore, these are some of the first games we’ll see from Bethesda on the PS5! Check out the full article to see what details they included in their announcements! At the 2018 investor event, Sony Interactive Entertainment’s CEO, John Kodera, confirmed that the PS4 is in the final stage of its lifecycle. Furthermore, he hinted at the timetable for Sony to take the next big step on its gaming front. Check out our full article to find out everything we learned! Marcus Sellars, a game journalist known for breaking news before it hits, has revealed that PS5 dev kits are being sent to third-party developers. He’s been right several times in the past, so it’s entirely possible that this rumor is true.If developers are already working on PS5 games, could this mean that the console is coming in 2019? Find out what we think in our full article! IDC Analysts Predicts PS5 in 2021 – January 3, 2018Speaking with Gaming Bolt, IDC research director Lewis Ward predicted that the PS5 will release in 2021, but admits this is a placeholder in his forecast. This is later than other analysts have predicted, but with PS4 sales still going strong, it’s possible that Sony would wait even longer to release the PS5.With over 70 million PS4 systems sold, the numbers continue to rise. Could the PS4 reach over 100 million sold by the time the PS5 releases? At this rate, it seems very likely. Paris Games Week May Have Shown PS4’s Final GamesThe showing that Sony had at Paris Games Week was better than anyone expected. Perhaps it was the lack of hype surrounding the show, or the sudden influx of exciting announcements, but the show did a great job of revealing new titles, while also updating us on fan favorites like The Last of Us.With the PS5 looking more and more like a console that will release in 2020, new announcements like Ghost of Tsushima probably won’t release until 2019 at the earliest. With games like The Last of Us Part 2 and the new God of War coming in 2018, it seems like these could be the games that make up the PS4’s swan song. Find out more in the full article linked above! On an investor call, Ubisoft’s own CEO Yves Guillemot said that he believes the PS5 is at least two years away from releasing. His logic is grounded in the fact that both the Xbox One X and PS4 Pro released recently. This is, of course, a prediction, but it’s safe to say that a huge publisher like Ubisoft would know about the PS5 in advance because they would most likely be doing launch titles. That would put the PS5 right inside of our predictions. Sony Has Confirmed the PS5!. PlayStation’s boss, Shawn Layden, confirmed in an interview that there will indeed be more PlayStation consoles. The PS5 is going to happen, it’s just a matter of time. This isn’t the first time Sony has toyed with the idea of a next generation console, but it is the strongest confirmation we’ve received thus far. He did say that the PS4 is breaking new ground for Sony, so that could affect the plans going forward, but the company is going to produce more PlayStation consoles. Find out more in our full article! Avalanche Studios recently opened up a position at their studio for someone to work on a project being developed for “both current and next gen platforms.” It’s possible they are simply future-proofing an engine, but other rumors point to them working on an unannounced AAA title for next-gen consoles. Could this be a PS5 launch title? Check out the full article for more info! GT Sport Could Run at 8K on PS5! In a recent tour of the studio behind Gran Turismo, Finder.com reported that the developer is already creating cars that are over-specced for the PS4 Pro. They are indeed preparing for the graphics we’ll see on the PS5. The series creator even believes the PS5 will run GT Sport at 8K resolution! If a major developer like this is already planning for PS5, that can only mean that the future is coming sooner than we think! Infamous analyst, Michael Pachter, has predicted that Sony is waiting to see how Project Scorpio does before they finalize their PS5 plans. Depending on the outcome, they could change their timelines, according to him. Damian Thong, another major analyst we’ve discussed before on the site, seems to think Sony will release their PS5 console in 2018 to record-breaking profits! Are we in agreement on this? Take a look at our full breakdown of his predictions in the full article! PS5 Confirmed by a Sony Executive: Coming in 2018? A Sony executive recently said that we’ll be certainly seeing more PlayStation consoles in the future. That’s a PS5 confirmation if I ever heard one! In other news, an analyst is also predicting that PS5 will be here in the second half of 2018. He was right before about the PS4 Slim and PS4 Pro, so is he on to something? Find out more in the full article! Sony’s President, Shuhei Yoshida, was talking about PS5 in an interview. When asked about the existence of PS5, he said “you mean if…” which makes us all wonder if Sony has stalled production on the PS5. Why would he refer to Sony’s new console like this? It’s either a red herring, or the worst news we’ve gotten in a long time. Find out more in the full article! Michael Patcher, known for making bold and sometimes ridiculous claims about the gaming industry, made the statement that this current console cycle would be the last of its kind. Sony’s next move in the world of gaming, according to him, will be a cloud-based experience akin to services like Netflix, but for gaming. Is it truly possible that the PS4 is the last console we’ll ever see from Sony in the traditional sense of the term? Check out the full article to find out! AMD is making some bold claims about their chipsets for the next generation of consoles. According to their projections, the PS5 will be five times more powerful than the PS4! This is based on projections for their company’s chipsets and their roadmap for development into the future. It seems like a big jump, but it would warrant the PS5’s existence. How is this possible you ask? Find out in our full article! 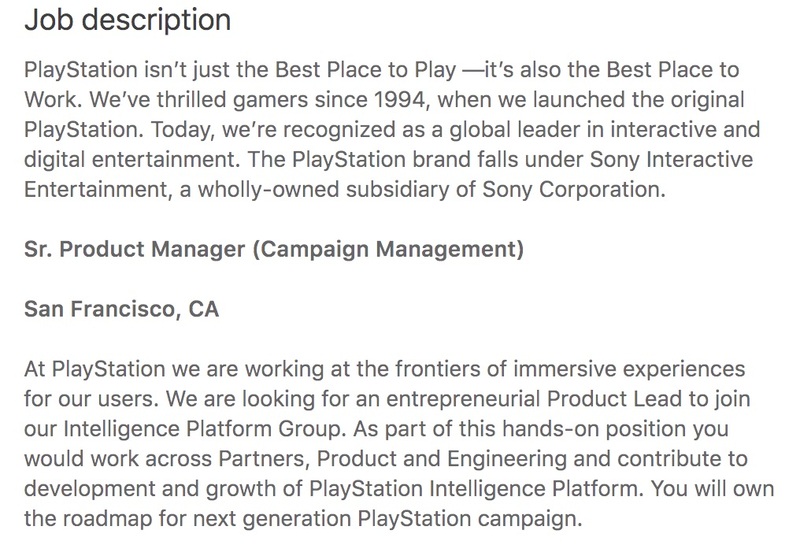 A job posting appeared on the PlayStation website looking to hire a senior programmer. Are they hiring for the PS5? This could also be a job posting that was meant for work on the PS4 Pro, but from the description, it sounds like they would be working on a new operating system. Could it be that the PS5 is already close to completion, and Sony is holding back to try and make the PS4 last as long as possible with the addition of a VR headset? If we combine this thinking with the release of the PS4 Pro, then we know Sony isn’t ready to unveil the PS5. Are they waiting for technology, or are they worried consumers won’t accept a new console this early? Now that researchers at Rice University have discovered how to create 3D Stacked RAM in a fraction of the time and cost, rumors are swirling that Sony will jump at this opportunity to use the technology in the PS5. Both Sony and Microsoft are always looking for ways to one-up each other in terms of system power. 3D stacked RAM would certainly give PS5 an edge over Project Scorpio (Xbox 2). Check out our full article for all the details! Nintendo Begins Working on a New Console, What About Sony? With Nintendo officially confirming the existence of a new console to replace the Wii, rumors are out in the wild about how powerful it will be. Is Sony going to strike first with the PS5? Combine this with the existence of Xbox 2 (Project Scorpio) and Sony is in quite the position. Even with PS4 Pro coming out in November 2016, we have to think about the long term competition. Find out more in the full article! PS5 Release Date is early! A recent AMD presentation talked about the possibility of shorter console cycles. Does this mean we’ll see the PS5 earlier than expected? It’s possible, but with the PS4 Pro announced, it could be that AMD was referring to this recently unveiled console. Sony doesn’t seem too keen on shortening the console life cycles either. When did Sony start working on the PS4? If you guessed 5 years before the launch of the PS4 you are correct. Mark Cerny the lead system architect for the PS4 was once quoted as saying “the development of a next-gen platform started about five years ago.” The concepts began swirling around as early as 2008! This was only a mere two years into the PS3 life cycle. Interestingly enough, Sony partnered with Bungie, the developers of Halo and Destiny, to design the PS4 controller so that it would be more beneficial when being used in first person shooters. In 2012 development kits started going out to developers. These were bare bones PC rigs with the new AMD Accelerated Processing Unit chipset included. They were codenamed “Orbis.” Sony officially announced the PS4 in February of 2013 at a special event, thus revealing its existence to the world. How Does PS4 Pro Factor into This? The PS4 Pro is one of two consoles that are redefining the way we think about generations of gaming consoles. Between this and the Xbox One X, we’re seeing new consoles that bring us increased power and performance, but they’re not consider next generation machines. That’s a confusing concept for gamers, and it’s one that we’re all still trying to collectively wrap our heads around. The PS4 Pro released in November of 2016 to positive reviews, but everyone was left asking how this affects the future of gaming, and where original PS4 owners stand. For starters, we found out that, while the PS4 Pro is indeed 2.28 times more powerful than the PS4, it doesn’t have a new GPU. Instead, it’s a double-sized version of the original which can be turned on an off depending on the support for Pro’s extra power on PS4 games. The biggest qualms with the PS4 Pro lie within it’s lack of UHD Blu-Ray support, and the fact that games don’t always render in native 4K. In many cases, they come very close, but enthusiasts want nothing less then native support. We all assume that 4K should be the focus, but what if VR is the future? We always assume that televisions are the way we’ll play games forever, but anyone who has played VR knows that this could change. As of now, Sony is very steadfast in their decision to not have any PS4 Pro exclusive titles. In fact, if a game isn’t patched or made with PS4 Pro support, then it plays just like it did on the PS4 since the extra GPU is shut down in these instances. Cerny said that Sony has put “a very high premium on not splitting the user base in that fashion.” What happens in the future when a game is made for Pro, but doesn’t run well on the original PS4? Cerny didn’t speak to that scenario, but suffice to say, we’re already seeing performance gaps. Hellblade: Senua’s Sacrifice – This title offers twice the resolution of a standard PS4. It targets 2560 x 1440 and adjusts based on the framerate. There’s also a 60hz mode that focuses on 60FPS gameplay. Horizon: Zero Dawn – 1080p TV owners enjoy supersampling that offers smoother edges and detailed textures. Checkerboard rendering offers higher resolutions for 4K owners and HDR support as well. Ratchet & Clank – This game looks absolutely incredible on a 4K TV with PS4 Pro. It uses a technology called Temporal Injection that produces some insanely crisp visuals. Rise of the Tomb Raider – This game is one of the best examples of how developers give players options on the PS4 Pro. You can choose to focus on the resolution or the frame rate to tailor the experience how you like. Even 1080p owners can take advantage of supersampling. Then we look at something like PlayStation VR. Having played VR titles on both the PS4 and PS4 Pro, I can say that there’s a noticeable difference between the two. People were shocked when Sony was able to get VR working on a PS4’s hardware, but with Pro, we’re looking at much more suitable hardware for virtual reality games. Sony’s lofty ideas, combined with the creative vision of developers, results in a need for more and more power. That, combined with console gamers wanting something similar to PC quality, is why the PS4 Pro exists in the first place. In addition, Cerny said that Sony left out the 4K Blu-Ray player because they believe that “streaming is the future.” As of right now, this applies solely to video content, but could this mean that Sony wants to stream games as well? This would support our theories on PS5 possibly incorporating a game streaming solution. Now that the PS4 Pro is here, it will be interesting to see how this changes the landscape of the industry. Now that Xbox One X is released, we’ll see even more about what this competition could mean for the industry. One thing is certain, Sony will use this system to inform their decisions for PS5 and ensure that the PS5 will do what the PS4 Pro won’t or couldn’t. This is yet another piece of evidence that points to our 2020 release date. I know we’re all excited here, but if there’s one thing people want to know about new consoles, it’s the price. Between the PS3 and the PS4, Sony changed their minds to the tune of $200 dollars. It’s clear that gamers don’t want consoles to spike in price, but they also want power, so where does the balance lie? Join us as we examine the price of the PS5! Are Shorter Console Life Cycles The Future? Game consoles represent huge investments for consumers. Between the games, the accessories, and the subscriptions, it’s no wonder people get angry when we bring up the concept of yet another console. Boy oh boy, though, do people get angry! If you try to bring up the subject on forums like Reddit, expect to get sufficiently “ripped a new one,” as it were. A new iPhone or Samsung Galaxy phone comes out each year and people rush to buy it, no questions asked. What’s the deal? I get that these two examples cater to different types of consumers, but seriously? The level of acceptance versus the level of hostility is just insane. Here’s the problem though: technology outpaces consoles insanely fast. Anyone who is a PC gamer will know, just when you think you have the greatest rig, a new GPU or CPU comes out and suddenly you’re obsolete again. The PS4’s hardware is amazing compared to the PS3, but it’s already outdated by a long shot when you compare it to modern gaming PC’s. Since you can’t swap out parts in the PS4 or in any home console for that matter, you need to replace it sooner to keep up with technology. That’s the hard way of looking at it, but Sony has a more level-headed approach. I’m of course referring to Shuhei Yoshida’s quote regarding the PS5 when he said that developers will decide the right time to release it. If they don’t have the power they need, then it’s time for PS5. Classic cryptic Sony talk, but a solid outlook. That’s going to be a tall order with the way technology is progressing. Taking the two quotes from each of these Sony executives, they almost sound like they’re at odds with one another as to what they want from the PS4 life cycle. Obviously they want their product to remain relevant, but it’s only a matter of time before developers will want that extra power. So what’s the alternative? Build a better console faster than before? No, probably not. Instead, it’s likely that Sony will need to adapt to a more service-oriented future that turns the home console into more of a set-top box like Amazon Fire TV or Roku, or even Apple TV. If games took the form of apps and streamed to your television from cloud servers, then Sony would have no need to release new consoles. Instead they would sell the games through these streaming boxes and possibly offer a subscription like PlayStation Now as well. As it stands, the PS4 is selling extremely well and beating out the competition. With factors like PlayStation VR and the rising tide of new technology though, it’s going to run out of runway sooner than later. The developers will need more power and angry fans or not, we’ll need to start talking about the PS5. Looking at the cycles of past PlayStations can we begin to chart a course of when we should expect to see the PlayStation 5! Back in 1994, Sony unleashed the PlayStation on the world, a bastion of high-end technology that changed gaming as we know it forever. It was only six years later that it outdid itself with the PlayStation 2, a system that many still believe is the crowning pinnacle of the PlayStation brand. It made history as one of the best-selling video game consoles ever. Following a pattern, six years later the PlayStation 3 was released, ushering in an era of online games and networks that once again changed the face of gaming forever. Then came the PS4, which blew its rival the Xbox One out of the water. PS4 sales going into 2017 were looking awesome with an almost 2-to-1 ratio in Sony’s favor. And then of course, you have the PS4 Pro, which sends everything into uncertainty. For the first time, a new and more powerful console has entered the fold in the middle of a generation. Thus far, it seems like fans are adopting it pretty quickly for the graphical boosts and 4K support, not to mention the enhanced PlayStation VR experience. We are continually updating this page with new information as it breaks that could alter our current predictions. In 2013 we came within a few days of predicting the actual PS4 release date, no one else came closer. We plan on having the same high accuracy for the PS5 release date. Thus far we’ve been hitting you with hard facts and rumors from other news sources, but we as gamers feel the need to throw in our own predictions as well. At this stage in the game, the more ideas we have, the better, because that drives us towards the ultimate goal of pinpointing the exact date of the PS5 release. Currently, the PS4 has sold over 60 million units worldwide and is leading over Microsoft by a large margin. There’s no signs that it’s slowing down either. While we do acknowledge the fact that the PS4 hardware is going to run out quickly because of its inability to be upgraded, we also point to the growth that he PS3 experienced in its final years. Compare a launch title like Resistance: Fall of Man to the original release of The Last of Us and you’ll see that developers clearly saw ways to get more horsepower out of the system as the years went on. Game developers are innovative and creative people. Yes, there will be a demand for power, but no, that won’t stop them from finding ways to use what they have. What I’m saying is that our 2020 release date prediction for the PS5 is far more accurate that 2017 because the PS4 Pro was released in holiday of 2016 and Sony plans to have it become the standard for the foreseeable future. I think Sony is already running tests on the PS5 and I think it will be ready, or at least playable by 2018, but I also think Sony is going to play their cards close to their chest. If the PS4 sales plummet or developers simply can’t do what they want with the hardware available, then yes, Sony will unveil the PS5 to invigorate the market and build hype, but without the need for a new console in terms of business and innovation, Sony will keep things under wraps until the time is right. For now, we have the PS4 Pro and PlayStation VR, both of which are riding high in the eyes of the consumer. They are both young, with a lot of games ahead of them. I would like to play devil’s advocate for a moment though. What if the PS5 is coming as soon as 2018? We’ve already discussed how the PS5 will most likely be a cloud-based on console so what if Sony is already testing the market for such a product? We all know about PlayStation Now and if you don’t, it’s a streaming service like Netflix, but for games. Sony could be using this service as a testing ground to see not only if the public would support a cloud-based system, but if the demand is there. It’s not an entirely far-fetched concept. As it stands, we’re going to keep scouring the internet for more clues, rumors, and news to keep this page as accurate as possible. Join in with thousands of others on our Facebook, Google +, and Twitter pages. Don’t miss out on all the PS5 discussion. When do you think the PS5 is coming? Why? Join others in the comments below! We also accurately predicted the PS4 (within a few days) 5 years before its release. It would be nice to see Sony actually create a feature that would allow Backward Compatibility to play all previous PS games on it without any issue. I believe it will be more about money as opposed to what players actually want. Time will tell. Been a massive PS fan for years, but am now slowly going off it. Time between PS3 and PS4 was a 7 year period. PS4 came out at the end of 2013. So it’s only been out 5 years. I think a more accurate prediction would be the end of 2020. PlayStation 5 looks good. It is backwards compatible.I can play PlayStation 4 games on it. I’m so excited for ps5 if you keep PS3 on too if ps5 is more money so. I think i will be released in 2021. Know body cares about Xbox its dumb PlayStation rules everyone’s life.!!!!!! I JUST BOUGHT THE PS4 PRO!!! If PS5 comes 2018 that won’t be good for PS4 Pro. Lots of people recently bought PS4 Pro but every new PS generation ruined the other. When PS4 came, in gta 5 online updates were less and bad in PS3. They make all good features for the latest generation. I heard that if PS5 came out, its cd will work on PS4 Pro. But still that doesn’t mean that all game features would work on PS4 Pro as the cd works. Aslong as they let it have the (then) current best graphics and processors. I don’t mind spending more money for a top notch console. If they’re smart they’ll release the PS5 and PS5 Slim at the same time. with the slim version having lesser specs. That way people can choose how much they want to spend on their new console and what power they want.